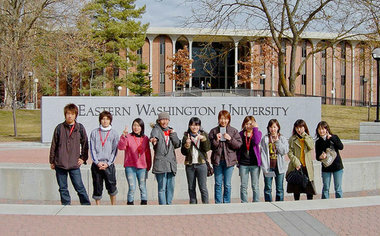 The College is guided by its stated mission and sustained by its vision: The College of Business and Public Administration (CBPA) is a unit of Eastern Washington University (EWU), a regional comprehensive public university located in Cheney and Spokane, WA, with programs offered throughout the state and online. Supporting research to maintain an involved and intellectually current faculty dedicated to teaching. Offering inclusive intellectual and community engagement to enrich students and society through lifelong learning. Our motto is "Focusing on the region - open to the world." The College's vision is to have its programs in business, economics, public administration and planning recognized for their excellence and to be the college of the first choice in the region educating public, private and non-profit leaders. The College of Business and Public Administration provides quality education that prepares its graduates to be successful professionals, to advance in their chosen careers, or to continue on to post-graduate studies. Our faculty members are excellent teachers who are current in their disciplines through research as demonstrated by their publications and through involvement in professional practice and service to their professions and their communities. Our graduates are ethically sensitive decision-makers well versed in best practices of their chosen professions, and ready to perform in the global environment. Our graduates are excellent communicators, adept at using the most current communication technology, and attuned to cultural sensitivities; they are prepared to work in their local environment, their region and in the global environment. Our faculty and students value ethical conduct and professionalism and maintain the highest academic standards. Our students, faculty, and staff are culturally diverse. The College promotes a climate that builds positive awareness of ideas and perspectives related to cultural diversity. Provide a learning environment that supports and encourages students to engage in life-long learning. Provide an atmosphere that fosters academic excellence and supports faculty and staff development. Offer programs in the Greater Spokane region, across the state and online that serve the educational needs of current and future students. Increase resources to support the mission of the College. Expand outreach activities that promote sustainable economic and community development. Dung Chen; EnTie Commercial Bank in Spokane, WA, and graduate of the EWU MBA program. We asked Dung why he chose to earn his MBA at EWU. He said, "Because the lower cost of tuition was affordable and I have family in Spokane”. Regarding his MBA experience, Dung says, “I enjoyed the learning and leadership opportunities and teamwork aspect of the program. The class schedules were also really convenient”. When we asked Dung about the benefits of earning his MBA degree. He said, “The MBA program taught me managerial skills and organizational skills that help me in my current work”. This is Dung Chen’s advice for current MBA students, "Build connections with classmates because they all have different backgrounds, experiences, and skills that you can learn from".